From blizzards to snow and ice, we can’t seem to catch much of a break from extreme winter weather conditions in Kansas City this year. And now we can add dangerously cold temperatures and wind chills to the growing list of winter weather woes. A polar vortex is forecasted to grip the Midwest, bringing some of the coldest weather in years and putting people and animals at risk for hypothermia and frostbite. According to AccuWeather, the deep freeze has already settled in to the North of us, with wind chill readings as low as -75 degrees Fahrenheit in Grand Forks, North Dakota. As the polar vortex moves into our region, we’ll also see extremely cold temperatures and wind chills below zero. Currently, the Kansas City Metro area is under a Wind Chill Advisory starting today at 6:00 p.m. CST through Wednesday, January 30, 2019 at 12:00 p.m. CST. With wind chill temperatures expected to dip into the -20 degrees Fahrenheit range, we must be careful to avoid hypothermia. Hypothermia is a condition where the body's core temperature drops to a dangerous level, making us very ill; it can even lead to death. This can easily happen when the body is wet and exposed to frigid temperatures. When unprotected skin is exposed to these low temperatures, it also increases the risk of frostbite. 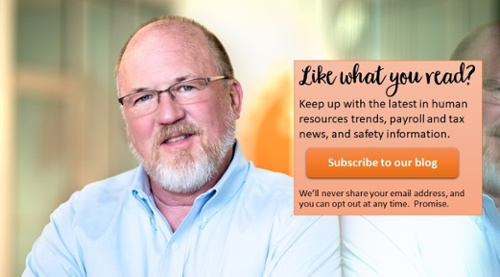 Axcet HR Solutions Safety and Health Consultant Randy Clayton advises employers to be aware of forecasted dangerous weather conditions, know the signs of hypothermia and have a thorough understanding of appropriate treatment. Worker safety should always be a top concern, and as such, employers should implement employee cold weather health and safety programs and training sessions. Are you uncertain if you can require employee attendance on inclement weather days? What about pay? Read this blog to find out what our experts have to say. Fumbling fingers; trouble with use of hands. A sense of discomfort or pain. If you think you’re experiencing MILD hypothermia, you should get out of the cold, drink warm fluids and get into warm clothes. If you think you, or someone around you, is experiencing MODERATE/SEVERE hypothermia, call 911 immediately. Hypothermia is a medical emergency where the body is unable to warm itself. Additionally, remove wet clothing and wrap up in warm blankets. Remember to never actively warm up a victim of MODERATE/SEVERE hypothermia through use of hot water bottles, hair dryers, etc., as this can cause greater problems. Warm, not hot, liquids can be consumed. Do not consume alcoholic beverages. Thinking about calling a "snow day" due to inclement winter weather? 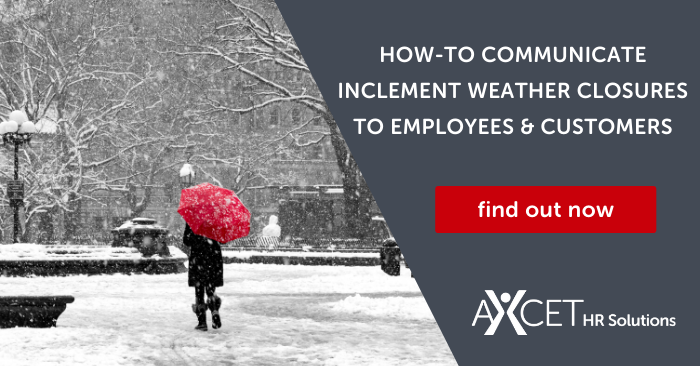 Read this blog to find out how to communicate weather-related business closures to employees and customers. * Make sure all of your skin is covered. This includes wearing hats, gloves, coats, scarves and warm footwear in layers. * Eat fruit and or consume sweet warm drinks. Eating is important, as it fuels your body to help keep it warm. * Do not overexert yourself causing perspiration. * Stay as dry as possible. * Plan ahead; ensure your car has emergency supplies and plenty of gas. Following these guidelines will help you retain your body heat, reducing the risk of frostbite and hypothermia. Stay warm out there!